Kirunda Kivejinja was heading to Namisindwa to campaign for NRM party candidates. Courtesy photo. The Deputy Prime Minister, Kirunda Kivejinja, was yesterday evening involved in a fatal motor accident on his way to Namisindwa district. Kivejinja was heading to Namisindwa to campaign for NRM party candidates for the district chairmanship George Opus and Grace Watua Namuhura for the Woman MP. Kivejinja is one of the senior party leaders deployed by President Museveni to solicit votes for party candidates ahead of tomorrow’s by-election in the five newly created districts. The new districts include Bunyangabu , Kyotera, Pakwach, Namisindwa and Rukiga. Kivejinja, a veteran politician, was deployed in Namisindwa district because the area has many veterans.He is also representing President Museveni who is in NewYork , attending the United Nations General Assembly. Ismail Kibedi, a family member to Kivejinja, said their father is currently at the International Nile Hospital in Jinja. The incident happened at Magamaga near Iganga town at about 8:30pm and the Police have not yet confirmed the cause of the accident. The NRM Deputy National Treasurer, Dr. Kenneth Omona, who attended the Namisindwa rallies together with Kivejinja explained that the elderly politician was travelling with his driver and body guard. Justine Kasule Lumumba, the party secretary general, said a special team has been dispatched off to further assess Kivejinja’s health situation. Meanwhile, after sweeping all the by-elections and wining electoral court cases, Lumumba is optimistic that her party will win all the five districts. “We pose a possibility of earning the ruling political party an extra five seats in Parliament,” she added. She said the NRM government was still committed to offering more services in the area, citing the upgrading of Kibiito Health Centre IV into a hospital status and construction of a seed secondary school in Kiyombya S/C. 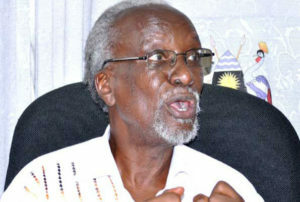 According to Rogers Mulindwa, the party communication officer in Kyotera district, the NRM party has deployed Moses Kigongo, the vice chairman of the party to drum up support for Patrick Kintu Kisekulo and Rachael Nakitende. After being defeated in the NRM primaries, Charles Zirinda Lubega, the acting chairman of Kyotera district, never conceded. He went ahead to contest as an independent candidate against Kisekulo. Haruna Kyeyune Kasolo, State minister for Finance, is reportedly to backing Kisekulo and he is being accused by Lubega’s supporters of having influenced the outcome of the NRM primaries in favour of Kisekulo. Two days ago, the secretary general of the party Justine Lumumba was in the district soliciting votes for NRM candidates. And EALA legislator Mathias Kasamba has also been in Kyotera district for over two weeks now.